I have had a really nice long weekend and though I'm returning to work today, I don't mind too much as the weekend doesn't feel terribly far away. The festive feeling has undoubtedly set in and the Christmas decorations were put up in force yesterday evening in my apartment. Molly and I are officially living in Santa's grotto and it certainly is a marvellous place to live! Here's a little look at the man himself in red, sitting on a lovely leather couch. 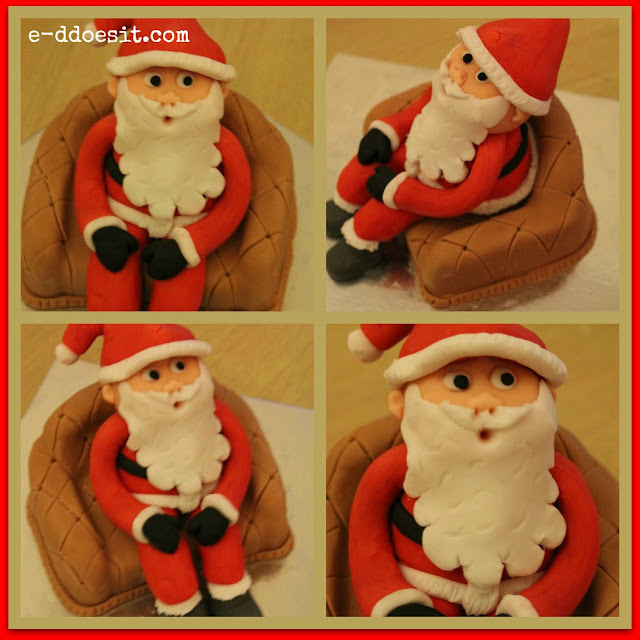 The entire figure is made out of sugarpaste. I'm planning on using this model as a topper for my Christmas cake. There are also plans for a 'Mrs.Claus' in the pipeline, so watch this space. I plan to do a step-by-step picture tutorial for Mrs.Claus, if anyone has any interest in making one of your own. Although this couch is made of solid roll out icing, you could alternatively ,make it using rice krispie mixture or cake. As I may have mentioned before, red sugar paste or roll out icing is very difficult to make yourself at home, as white roll out icing tends to turn pink when coloured with red colouring pastes or gels. 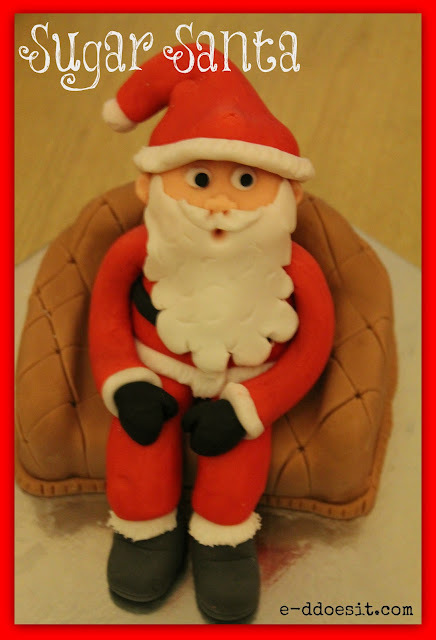 I have never been able to produce a red that was near the right colour for Santa using gel or liquid colourings I picked up a bag of M&B Luxury Sugar Paste in Decobake to save myself a lot of heartache. A 2.5kg bag is approximately €9.50, but smaller packs are available. Similarly with black, I buy this sugar paste pre-coloured as when coloured by hand the paste turns to look grey in colour and never a rich black which I often use for eyes on figures. Really I LOVE YOUR WORK!! It's amazing. Lovely comment as always, glad you like it! LOVE! So cute and dying to make!